In celebration of Konami's 50th anniversary, today the company announced three collections of classic games which will bring dozens of Castlevania, Contra, and arcade classics to PS4, Xbox One, PC (Steam), and Nintendo Switch early this summer. The Arcade Classics collection will also come with an ebook "with new information about the titles, including interviews with the development staff, behind-the-scenes insights, and sketches and design documents never before revealed to the public." The Castlevania and Contra collections will come with ebooks of their own, presumably filled with similar details. Interestingly, the Castlevania ebook will also feature input from Adi Shankar, a producer on the excellent Castlevania Netflix anime. 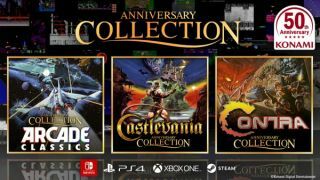 The Arcade Classics collection will release on April 18, 2019, while the Contra and Castlevania collections are scheduled for early this summer. Price points for the latter two collections have not been announced, but I'd wager they'll be close to the $20 price of the arcade collection. All three collections will only be available digitally. Let's hope the Castlevania Anniversary Collection is better than the rubbish Castlevania Requiem Collection.